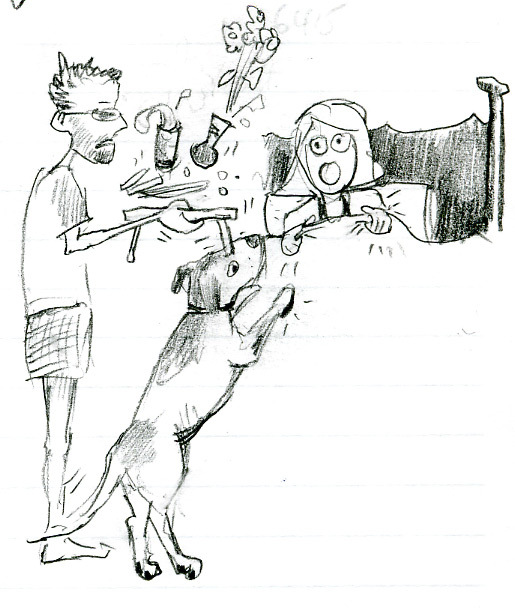 Robin said…I’d like to challenge you and request a doodle of your wife receiving her mother’s day breakfast in bed. It’s a challege because I know how hard it is for you to draw this beautiful woman! I didn’t get to finish this (left out the kids). 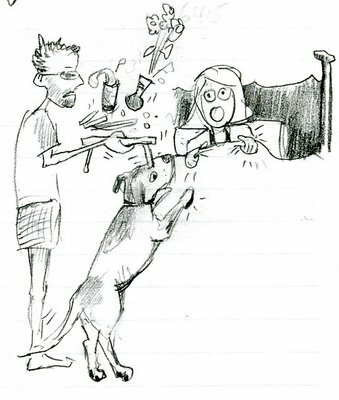 This is what happened mother’s day morning as we were serving mom breakfast in bed. Daisy (the dog) jumped on the bed and knocked the tray and orange juice, french toast, and fruit salad went a-flying. The mrs. thought it was funny. I was somewhat less than amused. This entry was posted in bed, breakfast, daisy, dog, doodles, drawing, holiday, mothersday, requests. Bookmark the permalink.